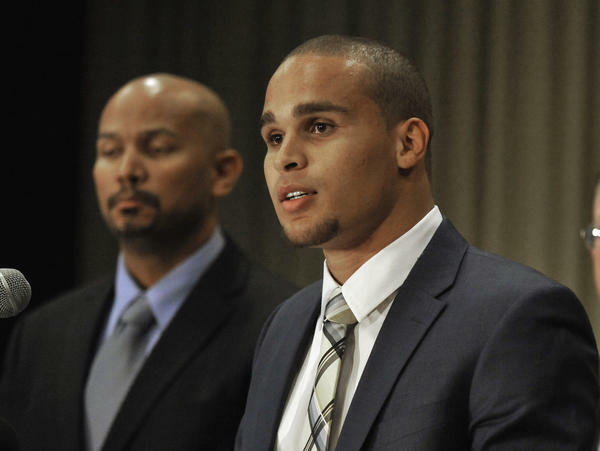 Kain Colter, the former quarterback for Northwestern University, led a push by players there to form what would have been the nation's first union of college athletes. The National Labor Relations Board rejected their bid to unionize this summer. This summer, football players at Northwestern University came very close to successfully forming a union — not to demand that they be paid, but to demand better scholarships and safety protocols. Had their bid succeeded, it might have changed college athletics — and, indeed, higher education — in some fundamental ways. Those changes are exactly what Sen. Lamar Alexander of Tennessee warned against when discussing the prospect of paying college athletes last year, a conversation that has been gaining steam in recent years at colleges across the country. "Imagine a university's basketball players striking before a Sweet Sixteen game demanding shorter practices, bigger dorm rooms, better food, and no classes before 11 a.m.," he said. "This is an absurd decision that will destroy intercollegiate athletics as we know it." Student-athletes at the University of Missouri flirted with Alexander's hypothetical doomsday scenario when they pledged to forfeit the team's remaining games this season if the university president, Tim Wolfe, did not resign. According to The New York Times, each game the team forfeit would cost the University of Missouri $1 million. Wolfe's resignation on Monday almost certainly came so swiftly because it was made by the one group of students who could most directly affect the university's bottom line. The grumbling around college players and labor and remuneration gets louder every year, particularly in March during the NCAA men's basketball tournament, when star basketball players tend to talk candidly about not having enough money to eat while the NCAA and CBS, which broadcasts the men's basketball tournament, haul in billions of dollars. A closely watched class-action lawsuit brought in 2009 by former UCLA basketball star Ed O'Bannon against the NCAA, which licensed the likenesses of athletes in video games, could have serious ramifications for whether more student-athletes can bring antitrust lawsuits against the NCAA. That case is ongoing. The idea that college athletes should be compensated is a deeply politicized one: 73 percent of white survey respondents told The Washington Post they didn't think student-athletes should be paid, while a majority of people of color said they should be. "People who are younger, more liberal, and less religious, were more likely to support salaries for college athletes than were their older, more conservative, more religious counterparts," Deadspin's Barry Petchesky wrote. In other words, paying college athletes is a culture war issue, even if we don't tend to speak about it in those terms. Meanwhile, the people at the center of that debate about whether and how and why student-athletes should organize — particularly those in revenue-generating sports like football and basketball — are much more likely to be black than the student bodies of their colleges more broadly. It was hard to find the specific racial demographics of the Missouri football team, but nearly 60 percent of the players in the SEC, the conference in which Missouri plays, were black during the last academic year, per the NCAA's website. Missouri's larger student body is only 7 percent black. "They probably have more to lose than an average college student would have to lose from this type of protest because they're on scholarships, and they potentially want to move on in their college careers, but they're public figures," Sarah Jackson, a professor at Northeastern University who teaches about social protest movements, told me. "But because of this, they also have a lot of power. There's a conundrum." Jackson said that athletes at large universities have a bunch of constraints on what they can do in their downtime and are more closely scrutinized than other students. But, she said, black athletes are often the most visible black students on their campuses; they make lots of money for their institutions, and they have regular contact with the local news media. "So in a lot of ways, they have access and privileges to public spaces that a regular student doesn't have," she said. The unprecedented success of this stand by Missouri's football players, coupled with the gradual shift toward more organization among student-athletes and the demographics of who those athletes are, suggests the Missouri case won't be the last time we will see student athletes flexing their muscles this way.